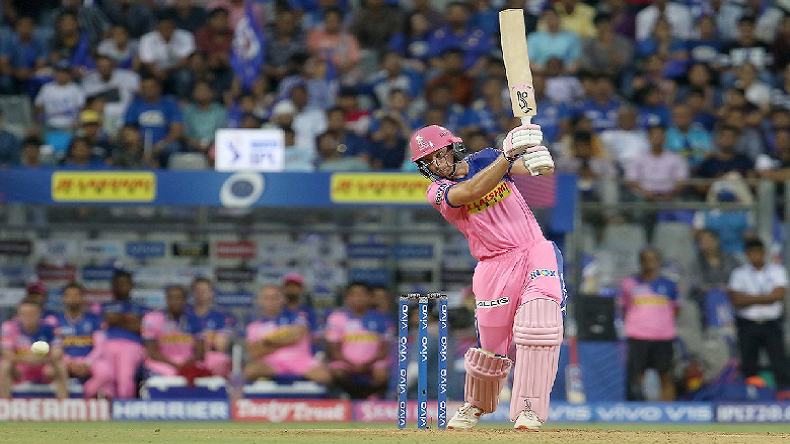 IPL 2019: Joss Buttler's 89 helps Rajasthan Royals beat Mumbai Indian's by 4 wickets in a last over thriller: Rajasthan Royals (RR) defeated Mumbai Indians (MI) in a last over thriller at Wankhede Stadium Mumbai by four wickets. It was the spectacular batting performance of Joss Buttler who scored 88 off 43 and helped his team to clinch victory over Mumbai. He was also awarded player of the match. The team registered its second victory in the ongoing Vivo IPL 2019. IPL 2019: Joss Buttler’s 89 helps Rajasthan Royals beat Mumbai Indian’s by 4 wickets in a last over thriller: Ajinkya Rahane-led Rajasthan Royals (RR) clinched the second victory in the Indian Premier League (IPL) 2019 by defeating Mumbai Indians (MI). Rajasthan comfortably chased a high scoring total of 187 and lost only six wickets. All thanks to Joss Buttler for his brilliant 89-run knock off 43 balls. Mumbai got a much-needed start with its openers Rahane and Jos Buttler scoring 60-run partnership. Rahane was dismissed for 37 off 21 in the seventh over. Buttler was joined by Sanju Samson and both took the team near to victory. Samson was departed when the score was 147 in 14th over. Buttler made 89 and smashed seven sixes and eight boundaries. Rajasthan lost four wickets on just four runs but that did not help Mumbai to turn the match away from 2008 IPL champions. They chased the score with three deliveries to spare. For Mumbai, Krunal Pandya claimed three wickets, Jasprit Bumrah took two and Rahul Chahar picked one wicket. Batting first, three-time IPL champions got a decent start as openers Rohit Sharma and Quinton de Kock engineered 96-run partnership. Both the openers laid a foundation for the high score. The first wicket fell in the 11th over when skipper Sharma was dismissed for 47 off 32 balls. It was followed by Suryakumar Yadav’ s dismissal for 16. Kock made 81 off 52 balls. Hardik Pandya played 26 run cameo in just 11 balls. For Rajasthan, Jofra Archer dismissed three Mumbai batsmen in his four-over spell. While Dhawal Kulkarni and Jaydev Unadkar picked one each wicket.